A Photograph of the Loch Ness Monster? Trawling around the Internet as I do for Nessie information, I came across this photograph on a website compilation of holiday snaps. The owner of the picture had been to Scotland and elsewhere in Europe from the USA and had decided to put up a montage of her experiences. However, one of the pictures shows something a bit more than normal. Here is a zoom in on the object of interest. It would appear the the picture was taken on the 15th July 2006 but the camera time is set at 0421. The location is given as a point off the Clansman Harbour at the north end of the loch but closer to the opposite shore, so the photographer was probably on a cruise boat (see map below). Now I have tried several times to contact the owner of this photograph (who I believe is called Nancy) but without success and this basically leaves me in a bit of no-man's land. The reason I say that is because if I did establish contact the day after this article posted, several replies may be forthcoming. For example, the owner may say "It's a Photoshop job, I was just fooling around.". In that case, there is not much more to say and we move on. Or she may say that is a genuine picture and we can take it from there. Or she may come up with some other reply such as "The cruise boat had a Nessie sticker on the window for tourist Nessie snaps." Of course, it may be the photographer is unable or unwilling to make contact. But despite these unknowns, perhaps this is an opportunity to explore an area of Loch Ness Monster images that provokes debate. I am referring to digital images of the creatures and the argument over whether they are digitally manipulated images. Of course, manipulated images of the Loch Ness Monster go hand in hand with the mystery itself. The 1977 Shiels picture is perhaps the best example, but the MacNab picture from 1955 has also been put under the scrutiny of sceptical enquirers. However, such alleged images form a small part of the overall set of images. Others have been accused of being staged props or misidentification, the rest are genuine images of the creature. Now one question levelled by sceptics today is why the clarity of the classic black and white pictures is not repeated today with superior cameras. However, when a photograph such as this turns up, it is automatically dismissed as a fake. Damned if you do, damned if you don't. The "too good to be true" syndrome kicks in almost by instinct. Now it may not have escaped your attention that the lake cryptid world has no lack of digitally faked images. A search for images of "loch ness monster" on google will throw up a good number of such "photoshopped" images (to quote the vernacular for such images). How can you distinguish the real from the fake? For me, this photograph is the catalyst to explore this more modern aspect of cryptid forensics more closely. At the "lowest" level of analysis, the aforementioned snap judgements are oft to the fore. A picture appears on a cryptid website and not long after we get the photoshopping comments. People will look at such images and get a "feel" for whether it looks right or not. Of course, this involves a mixture of objective and subjective assessments, but we need something that eliminates the subjective. At this point, I would have to point out that there are two types of photoshopped images, those that are intended to deceive and those that are intended as an obvious joke. The latter are not that difficult to spot. Those that intend to deceive put a bit more effort into their creation. 1. "Software" metadata in image file is "Photoshop"
I can't say I will exhaustively apply all these principles today - I am no expert on digital manipulation - but the need to "ramp up" on this aspect of Loch Ness Monster investigation has become more apparent to me. On the first point of the metadata, this is part of the Exif (Exchangeable image file format) data that makes up JPEG, TIF and WAV image files. This data contains information on the circumstances of the image such as camera make and model, date and time, exposure time and focal length. Since the data does not actually describe the image, it is called metadata. You can see this for yourself on a Windows system by right clicking on a picture file and selecting "Properties". However, on trying some images, finding the clue of subterfuge via the metadata was not as clean cut as one may think. One website that seems to be popular in looking for anomalies is imageedited.com. This will run some basic tests on an uploaded image file and hazard a guess as to whether the image has been changed. When I ran this photograph through it, the decision as to whether image editing had occurred was "Probably" though it did not list any image editing software as a culprit. Is this a decisive conclusion? I do not think so. When I ran another of the owner's photographs from Loch Ness which was no more than an ordinary snap of the castle, it gave the same result! It seemed apparent to me that both images had undergone some changes in preparation for web site hosting. One possible explanation being the downsizing of the image to a smaller size. I also wondered if an editing software program could be masked by running it through a subsequent, less suspicious program? Seeking to take this further, I came upon the website fotoforensics.com. On top of the metadata analysis I just mentioned, two further tools are employed to ascertain the originality of a photographic image. The first is called Error Level Analysis ("ELA" hereafter). This works on the principle that a JPEG image should uniformly and roughly have the same level of data compression (JPEG is a process which compresses the original image to a smaller file size but usually with the loss of information). Any differences in compression rate in an image is suggestive of digital modification. Edges. Similar edges should have similar brightness in the ELA result. All high-contrast edges should look similar to each other, and all low-contrast edges should look similar. With an original photo, low-contrast edges should be almost as bright as high-contrast edges. Textures. Similar textures should have similar coloring under ELA. Areas with more surface detail, such as a close-up of a basketball, will likely have a higher ELA result that a smooth surface. Surfaces. Regardless of the actual color of the surface, all flat surfaces should have about the same coloring under ELA. 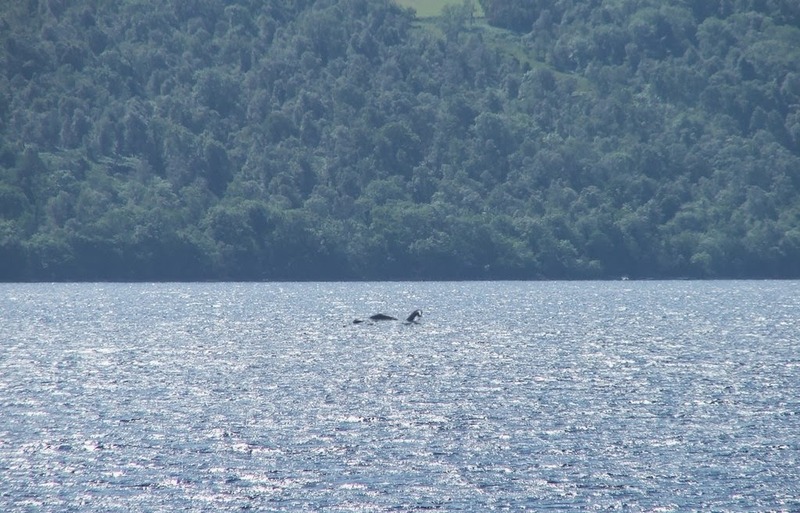 With that in mind, I looked around for some faked Nessie pictures to analyze. In each pair, the first picture is the original and the one below is the ELA image. The first one presents an immediate problem as this white Nessie has an ELA which is higher (i.e. more complex) than the sky of a similar hue. The next picture is taken from Claudio Diaz's Lake Monster Facebook page. Claudio has produced various Photoshop reproductions and these provide an interesting comparison (indeed, Claudio's opinion on this matter is solicited). Here we see that the brightness of the edges around the "monster" are not consistent with other low/high contrast edges indicating a problem. Another image from the Lake Monsters Facebook page shows a more indistinct hump image nestling within the reflection of Urquhart Castle. This fuzziness is mirrored in the indistinct lack of edge in the ELA image. A harder image to judge, but perhaps others have an opinion. Now I bring in the same process for the main photograph of our interest. The result is that, unlike the other pictures, the object here is barely visible in the ELA image. Is this significant and is it an indication of no digital manipulation? Perhaps, but there is no foolproof technique here and it would have helped to have the original and larger image. The second analysis tool is JPEG Quality. Each time an image file is opened in a graphics editor and resaved, there is a potential loss of image quality (this depends on the quality level selected). The loss of quality can be estimated and compared to other images. Using our fotoforensics tool, the JPEG quality is estimated to be 85%. When another of the Loch Ness holiday snaps from the owner was put through this filter, its quality level was also estimated to be 85%. This suggests both images went through the same sequence of events. If the Nessie photo had gone through an extra level of processing to add the "monster", then it would be possible for it to have a lower JPEG quality. So, some conclusions may be reached, but I suspect an expert digital manipulator could produce an image which only experts could judge at the pixel level. Since the owner of the photograph has not replied to my requests, the jury has to remain out on this one. But certainly, judging it purely as an image (independent of its source), it is a good one. You can see the precise detail that the object possesses as one observes the glint of the sun reflecting off the head and to a lesser extent off the humps. There is also the reflection of the neck on the water. Moreover, the image has packed more detail into a smaller area than the other images we compared here. On the opposite side of the coin, the second hump to the left of the main hump looks out of place. What could that mean? Also, the zoomed in pixellated area to the left of the neck reflection looks a bit strange, but how valid is an image judgement when individual pixels are resolved? So, I am bit new to this and would welcome comments from others who may have more experience of image analysis. I would also like to know when sceptics regard a photo as no longer "too good to be true" and not "photoshopped".